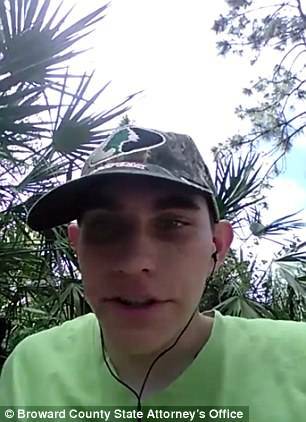 “My goal is to kill at least 20 people with an AR-15”: Prosecutors release disturbing cellphone videos that show Parkland school shooter, Nikolas Cruz happily revealing his plans. Following the arrest and prosecution of parkland school shooter, Nikolas Cruz, prosecutors have released new videos, where Cruz is seen boasting about his plans. Broward State Attorney’s Office have released three video clips recorded on cell phone belonging to Nikolas Cruz. 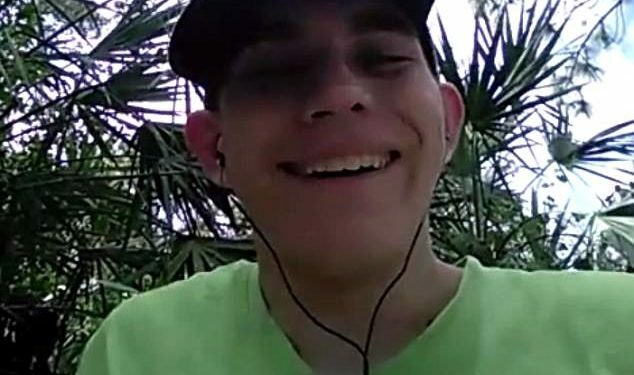 Cruz is seen laughing and smiling as he reveals his plans to target students at the school. In another segment, he mentions a girl named ‘Angie’ and vows to love her forever. Police say Cruz confessed to killing 17 people and wounding 17 others on February 14. ‘When you see me on the news you’ll know who I am,’ Nikolas Cruz says while laughing creepily in three separate clips recorded on his cell phone. ‘You’re all going to die. Pew pew pew. I can’t wait.’ He added in another video. The video clips were released by Florida prosecutors, according to the Miami Herald. ‘It’s going to be a big event,’ he said. In another video, he says: ‘Today is the day. The day that it all begins. The day of my massacre shall begin. Cruz then appears to offer a glimpse into a possible motive. ‘I’ve had enough being told what to do and when to do. … Telling me I’m an idiot and a dumb***,’ he says. Florida prosecutors say that the video boosts their case that Cruz carried out the shootings in a preplanned manner. Authorities are seeking a conviction for first-degree murder, which is a capital crime. If convicted, Cruz could face the death penalty. Cruz’s lawyer, a public defender, said that he intends to plead guilty in hopes of avoiding the death penalty. Police say Cruz confessed to the crime after his arrest about an hour after the shooting took place. Earlier, Nikolas Cruz left a comment on a YouTube video back in September 2017, using his own name that simply read: ‘I’m going to be a professional school shooter’ . FBI was warned about the comment but couldn’t identify him. After Cruz’s mother died, he moved in with the family of a former classmate, where he brought his AR-15 which was kept in a locked cabinet that he had the key to. He was able to purchase the rifle in the past year and passed a required background check. Federal law allowed people 18 and over to legally purchase long guns. At 21, people can legally buy handguns from a license dealer. Cruz was also studying marksmanship in the Army Junior Reserve Officers’ Training Corps. Cruz’s Instagram page is filled with disturbing posts of what appears to be himself showing off with weapons with his face covered, asking for advice on buying firearms, and making racist comments about Muslims. Students who say they knew Cruz claimed he liked to kill animals. His former classmate Joshua Charo, 16, said all he ‘would talk about is guns, knives and hunting’. Another student said he started selling knives out of a lunchbox when he started high school, while he was also found to be carrying bullet casings in his bag. Cruz had been getting treatment at a mental health clinic, but stopped about a year ago and dropped off the radar. He was showing signs of depression. Natalie Brassard, a program director at the non-profit FASCETS, which works with FASD children, said some of Cruz’s characteristics ‘suggest that he might have been living with an invisible brain-based condition. A lot of people however believe that Cruz is not only crazy, but evil.